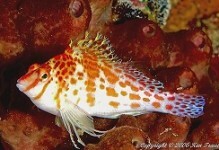 The Figure 8 Puffer is dark brown to green on the back with a white underside. 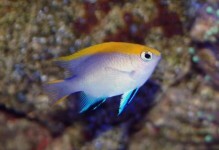 These fish have many yellow lines and spots covering the backside of the fish, giving it an interesting look. Also there are a few black spots that are outlined in yellow on the tail, body and nose. 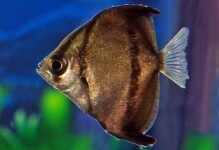 The ideal aquarium will have brackish water with many plants (either real or plastic), rocks with plenty of hiding places, and a sandy bottom composed of an aragonite-based sand. 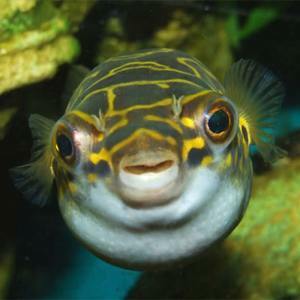 The Figure 8 Puffer can be aggressive to members of its own species, so care should be taken when housed together. Spawning occurs in brackish water. The eggs will be laid on the bottom, either on the substrate or on a flat rock. 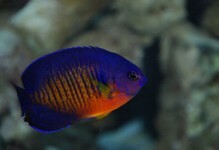 After the eggs are fertilized, the male will stay behind to guard them for approximately 7 days until the fry become waterborne. The Figure 8 Puffer should be fed crustacean foods such as brine shrimp, krill, mollusks, and earthworms.